How ready is the UK to combat current and future threats to our forests and woodlands? Almost exactly two years ago (February 2012) a consignment of ash trees sent from a nursery in the Netherlands to one in Buckinghamshire, were confirmed to be infected by the fungus causing ash dieback, Chalara fraxinea. By October of that year, it had been confirmed by Food & Environment Research Agency (FERA) scientists to be present in a number of woodland sites within the natural environment. The story was quickly picked up by the national press http://www.telegraph.co.uk/earth/earthnews/9660538/Ash-dieback-now-beyond-containment.html and other media http://www.bbc.co.uk/news/science-environment-20079657 and articles about the severity of the disease and our inability to control it spread proliferated at a fantastic rate. Partly as a result of this, the Tree Health and Plant Biosecurity Expert Taskforce was convened by the Government’s Chief Scientific Advisor in November 2012. I was invited to be a member of the Taskforce which was an independent, multi-disciplinary group of members of the academic community, https://www.gov.uk/government/uploads/system/uploads/attachment_data/file/200428/tree-taskforce-tor.pdf and very willingly, agreed to serve on it. Our remit was to “provide advice on the current threats to tree health and plant biosecurity in the UK and make recommendations about how those threats could be mitigated”. What surprised me and other members of the Task Force was the interest and emotional responses that ash dieback generated among the general public. After all, a few years earlier another one of our iconic tree species, oak, was under threat by another fungal disease, Phytopthora ramorum, somewhat misleadingly known as Sudden Oak Death, which despite its potential threat to cause landscape level changes comparable with those caused by Dutch Elm Disease (Potter et al., 2011) failed to cause the same level of media hysteria. Our best guess for why there was such an outburst of press and media coverage and subsequent public concern about ash dieback, was that the Chalara outbreak was the straw that broke the camel’s back. People, had perhaps become sensitised to forestry due to what seemed to be a constant stream of stories of threats, both man-made, such as the proposed sell-off of parts of the Forestry Commission’s estate by the UK government in 2010 http://www.telegraph.co.uk/earth/countryside/8082756/Ministers-plan-huge-sell-off-of-Britains-forests.html and natural, such as Sudden Oak Death and other pests and diseases. For the record, although Chalara fraxinea is now being treated as a quarantine pest under national emergency measures and is widespread across the United Kingdom and Northern Ireland, it no longer makes the front pages of our national newspapers. We in the Tree Health Taskforce did not just consider ash dieback; we reviewed the whole range of biotic threats, both current and future, and highlighted a number of reasons that we felt had contributed to the problems and made recommendations about how these could be rectified. In essence, how could we stop yet another ash dieback scenario occurring. Our joint report was published in May 2013 https://www.gov.uk/government/publications/tree-health-and-plant-biosecurity-expert-taskforce-final-report. One of our major findings was that the UK as a whole lacked, or would shortly lack, enough trained personnel able to recognise and respond to threats to our forests and woodlands from native and alien pests and diseases. One of the more immediate outcomes of our report was the rapid commissioning of some research to determine just how serious the situation actually was. The results of this report were published by Defra on February 5 of this year, TH0115 Strategic Analysis of Capability and Capacity to undertake Tree Health Research and Evidence Activity in the UK. The report highlighted research and evidence themes identified by key policy stakeholders and forest researchers from the university sector, research institutes and forest industry. 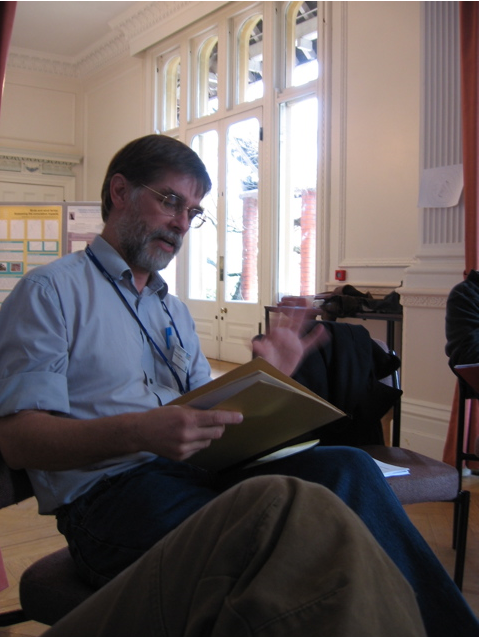 Ten themes were identified – Horizon scanning, Pathways and trade, Pest and pathogen biology and epidemiology, Detection and surveillance, Ecological patterns, Control and Management, Adaptation and resilience in forests and forestry, Governance and contingency planning, Economic evaluation and analysis and finally Public engagement, communication and citizen science. Three of the themes – Pest and pathogen biology and epidemiology, Control and management and Adaptation and resilience in forests and forestry, were identified as areas where existing research providers lack current capability and/or capacity in one or more types of expertise. The report also highlighted that there are serious skills shortages in the UK in mycology, plant pathology and entomology, especially in relation to forest health. Even in those disciplines where universities still run undergraduate degree courses, tree specific expertise such as silviculture, the care and cultivation of forest trees, was also noted as being in short supply. 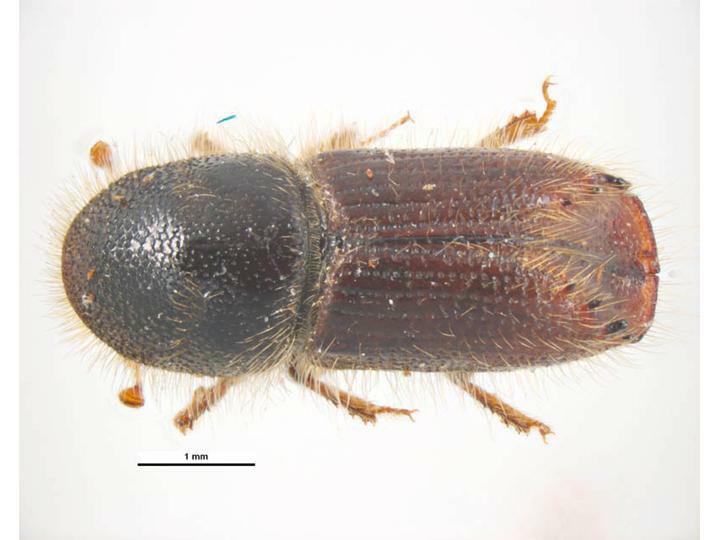 and the great spruce bark beetle, Dendroctonus micans since at least 1973 (Crooke & Bevan, 1957; Bevan 1987). Apart from Dendroctonus, none of these insects has however, had landscape level effects or for that matter, made the headlines to the same extent that ash dieback did. Since the beginning of the current century the situation has changed dramatically, the influx of tree pathogens has continued to rise at an almost exponential rate and the number of potentially landscape changing insect pests has also seen an increase e.g. the horse chestnut leaf miner, Cameraria ohridella, first seen in London in 2002 (Straw & Williams, 2013) is now found as far north as Liverpool in the West and North Yorkshire in the East (personal observation); the pine tree lappet moth Dendrolimus pini, established in Scotland since 2004. The oak processionary moth, Thaumetopoea processionea, has been firmly established in London since at least 2006 and looks set to spread further north and west (Townsend, 2013); it is probably only the bizarre weather we have had the last couple of years that has slowed it down slightly. The Asian longhorn beetle, Anoplophora glabripennis, caused some concern when an outbreak was found in 2012 in Kent; the eradication of which resulted in the felling of several hundred healthy trees. Given the time that it takes for an exotic insect to reach noticeable population levels, all these insects may have actually established four or five years earlier and it could already be too late to eradicate these pests. 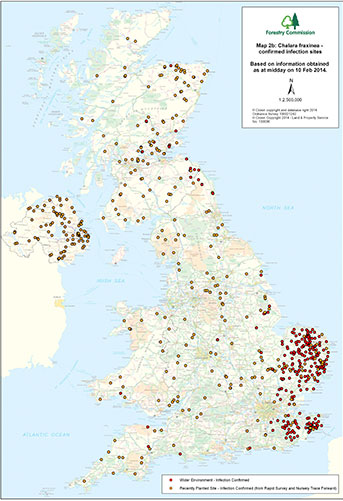 Attempts to eradicate the Oak processionary moth from London have, for example, now ended and been replaced by a policy of containment and eradication is only attempted in the case of new outbreaks outside London (Forestry Commission 2013). 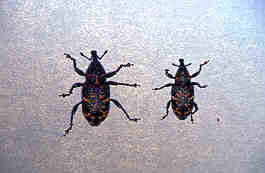 Another species which has often been intercepted since the 1970s, is Ips typographus, a severe pest of spruce. 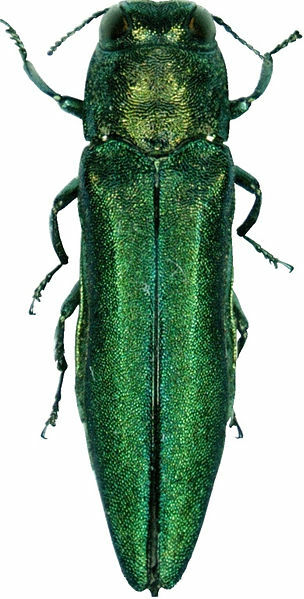 Other possible invaders include the pine processionary moth Thaumetopoea pityocampa, other Ips species attacking pine and spruce, and of great, and increasing concern, the emerald ash borer, Agrilus planipennis, a native of Asia which is now spreading rapidly outwards from Moscow (Straw et al., 2013). So what may have caused this flood of new forestry pests in the UK? The most obvious change to forestry practice in the UK which undoubtedly influenced the rise of the exotic conifer pests of the first half of the 20th Century was the large-scale afforestation programmes of many non-native tree species, brought about by the formation of the Forestry Commission in 1919. This rapid afforestation of sites, many of which had not had trees on them for centuries, provided new hosts for native pests and pathogens and inadvertently allowed the introduction of non-native insects. The other major change over the last 50 years or so is in global trade patterns; the world is a much smaller place, goods travel extremely quickly, come from much further afield and in greater volumes. The ability to transport living plant material has also much improved. In pre-container and pre-bulk air transport days, goods that were packed with unprocessed or poorly processed timber (pathways exploited by many bark beetles) took many weeks to make the long sea voyages and the insect pests often did not survive to make it to land and a new host plant. Long sea-voyages also meant that the transport of living plant material and their accidental insect passengers also had less chance of surviving to reach the UK. Another major change to our trade habits is the “instant tree/garden syndrome” where developers and the general public are no longer willing to wait several years for their trees to grow; rather they plant semi-mature trees, many of which come from outside the UK and which come with very large root-balls. It is impossible for the Plant Health and Seed Inspectorate (PHSI) service to check the huge volume of soil associated with these roots and many organisms must be entering the UK unbeknownst to the very over-stretched PHSI. An often overlooked change that I am certain has contributed to the large-scale invasion of tree pests and diseases, is a result of re-organisation of the Forestry Commission. 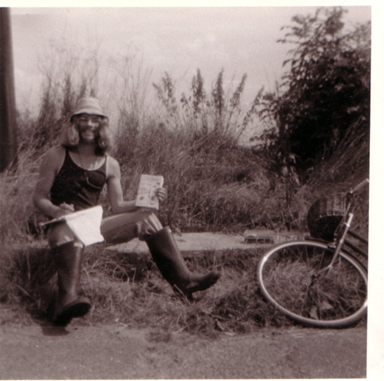 Prior to 1990, the Forestry Commission had a localised approach to forest management. Most forest blocks or amalgamations of them had a Chief Forester or Head Forester in charge of them. He (very rarely she), lived in the near vicinity and much like the old village Bobby, walked his beat regularly. Changes in forest health were thus much more likely to be spotted early and a forest pathologist or entomologist from either The Northern Research Station (NRS) or Alice Holt called in to make an assessment as to the cause of the problem. I worked at NRS during the 1980s and early 1990s so have had personal experience of the effectiveness of this system. By 1990, the Forestry Commission had amalgamated many forests and the number of District Offices was much reduced with a consequent reduction in the number of foresters living in near to individual forest blocks. Forest health problems were thus much less likely to be noticed at an early stage. The other major change was the decision to shift research to amenity forestry and away from commercial production forestry leading to a reduction in the number of entomologists and pathologists employed by the Forestry Commission as budgets were redirected. There are now no longer enough key personnel in these disciplines to cope adequately with current problems, let alone those likely to arise. At the same time within the university sector, the way in which government-funded universities was changed to a system based on the outcome of the notorious publication metric based Research Assessment Exercise. This disadvantaged academics specialising in niche applied disciplines such as entomology and plant pathology whose research output rarely, if ever, made it into the hallowed pages of Nature and Science. Recruitment of staff in these areas in the research intensive universities was severely curtailed and retirees replaced by molecular biologists or vertebrate ecologists publishing in so-called ‘high-impact’ journals (Leather, 2009). Universities have also replaced many specialist niche degrees with more broadly based subjects perceived to be more attractive to students. As a result, teaching in these areas has also suffered and very few biology undergraduates in the UK today have any experience with whole organismal biology or the field and taxonomic skills needed be able to recognise forest health problems outside in the real world (Leather & Quicke, 2010). The situation is now very critical, with, as far as I know only two forest entomologists (if you count me) and one forest pathologist teaching in UK universities today. This is not a healthy situation for the country and we in the Tree health and Plant Biosecurity Expert Taskforce highlighted the need to address key skills shortages in this area as an urgent priority (Defra, 2013). first Forestry Commission entomologist J W Munro writing just ten years after the formation of the Forestry Commission stated “The pine weevil (Hylobius abietis) problem still occupies the attention of the Forestry Commissioners” (Munro, 1929). The same statement is still as pertinent today although control measures for this insect have evolved greatly from the early use of DDT and organophosphates to more sophisticated, but possibly no more effective, biological control options (Torr et al., 2007). The pine beauty moth, once a harmless indigenous moth species, rose to become a notorious pest of the introduced Lodgepole pine during the 1970s and still continues to pose a threat to Scottish plantations today (Hicks et al., 2008). The often over-looked pine looper moth, Bupalus piniarius, may yet cause problems to our native Scots pine (Straw et al., 2002a). The green spruce aphid, Elatobium abietinum has never gone away (Straw et al., 2002b) and may, if climate change predictions are correct, make Sitka spruce a non-viable crop in the UK (Straw et al., 2009). This is a problem we ignore at our peril. Action needs to be taken, sooner, rather than later. As conventional chemicals are withdrawn and fewer chemicals approved for use in forestry, the emphasis must inevitably shift to biological control methods using classical natural enemies or biopesticide approaches with entomopathogenic fungi or nematodes or microbially derived pesticides such as Bt which was used against the Oak processionary moth in Berkshire in 2013. We may even be able to develop even more specific methods such as pheromone disruption combined with improved tree resistance (Leather & Knight, 1997). We need to improve quarantine measures, develop better detection methods and urgently provide more funding to enable the employment and maintenance of an expanded Plant Health Inspectorate as recommended by the Tree Health and Plant Biosecurity Expert Taskforce (Defra, 2013) and by TH0115. The latter report highlighted the widespread concerns about the lack of undergraduate and even more critically, the lack of MSc and PhD opportunities in forestry and tree health in particular. A key recommendation of the report is that funding needs to be put in place to support postgraduate level teaching and training support. This is to make sure a new generation of people capable of working in the tree health area, assisting a smoother and more efficient transition from broad-based undergraduate biology degrees to PhD level research. In addition, we need to persuade UK universities to employ forest entomologists and pathologists in academic posts by increasing the amount of appropriate whole organism research funding in these areas. The Forestry Commission’s Forest Research arm also needs to be able to expand its staff in entomology and pathology to enable it to cope with existing and future threats to our forest estate. Without such capacity building the future of forestry in the UK is uncertain to say the least. At the risk of seeming to blow our own trumpet still louder, another recommendation from the recent Defra report is that a virtual Centre for Tree Health Science should be created. This would be created by linking together those organisations currently active in the field and with appropriate training provision available. A number of recent key appointments and the newly launched multidisciplinary Centre for Integrated Pest Management (CIPM) mean that we at Harper Adams University are also in an excellent position to undertake research in this area. We are, as I write, involved in projects on Oak Processionary Moth and Acute Oak Decline. 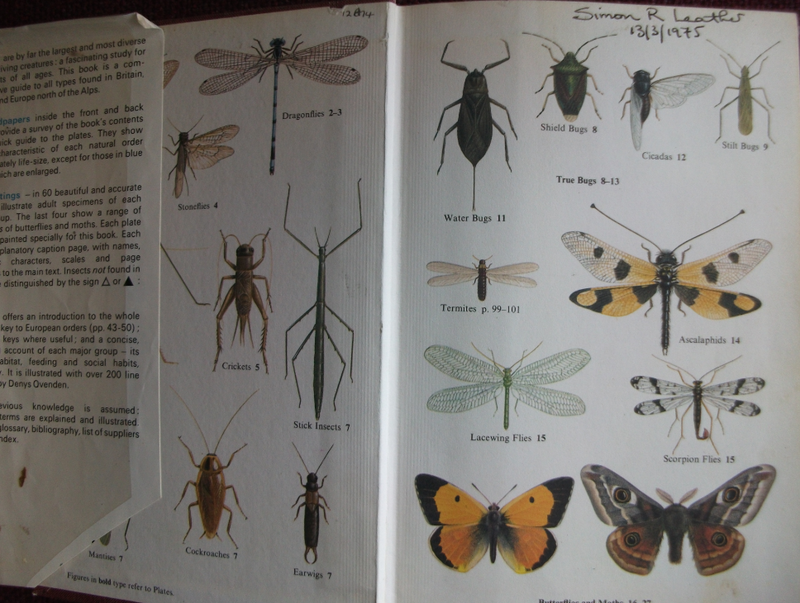 Bevan, D (1987) Forest Insects. Forestry Commission Handbook 1, HMSO, London. Hicks, BJ, Leather, SR & Watt, AD (2008) Changing dynamics of the pine beauty moth (Panolis flammea) in Britain: the loss of enemy free space? Agricultural and Forest Entomology, 10, 263-271. 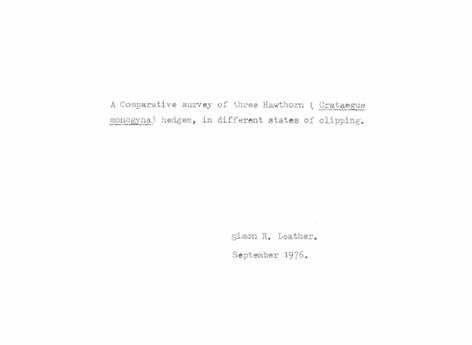 Leather, S.R. (2009) Institutional vertebratism threatens UK food security. Trends in Ecology & Evolution, 24, 413-414. Leather, SR & Knight, JD (1997) Pines, pheromones and parasites:a modelling approach to the integrated control of the pine beauty moth. Scottish Forestry 51, 76-83. Munro, JW (1929) The biology and control of Hylobius abietis L. Part 2. Forestry 3, 61-65. Straw, NA. & Williams, DT (2013) Impact of the leaf miner Cameraria ohridella (Lepidoptera: Gracillariidae) and bleeding canker disease on horse-chestnut direct effects and interaction. 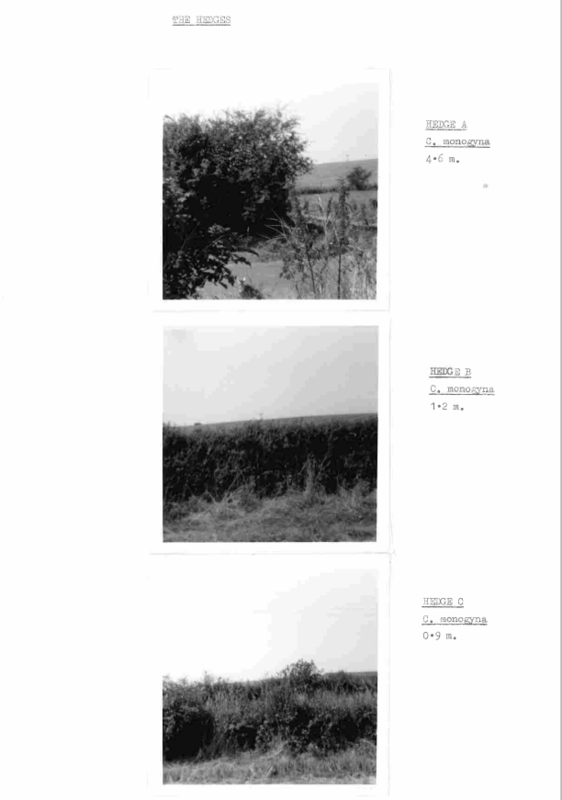 Agricultural and Forest Entomology 15, 321-333. Straw, NA, Armour, H & Day, KR (2002a) The financial costs of defoliation of Scots pine (Pinus sylvestris) by pine looper moth (Bupalus piniaria). Forestry, 75, 525-536. Straw, N.A., Timms, J.E.L., & Leather, S.R. (2009) Variation in the abundance of invertebrate predators of the green spruce aphid Elatobium abietinum (Walker) (Homoptera: Aphididae) along an altitudinal transect. Forest Ecology & Management, 258, 1-10. Straw, NA., Fielding, NJ, Green, G & Price, J (2002b) The impact of green spruce aphid, Elatobium abietinum (Walker), on the growth of young Sitka spruce in Hafren Forest, Wales: delayed effects on needle size limit wood production. Forest Ecology and Management 157, 267-283. Torr, P, Heritage, S, & Wilson, MJ (2007) Steinernema kraussei, an indigenous nematode found in coniferous forests: efficacy and field persistence against Hylobius abietis. Agricultural and Forest Entomology 9, 181-188. Townsend, M (2013) Oak processionary moth in the United Kingdom. Outlooks on Pest Management 24, 32-38.